Twickenham's centenary season may have ended, but the anniversaries still continue. January 28 marks the 100th anniversary of France's first ever visit to the stadium, in 1911. The French should have travelled with high hopes less than a month on from their first ever victory, over Scotland on January 2, but were hit by the loss of the two wings, Gaston Lane and Pierre Failliot, who had been vital to that victory. Le Figaro recorded that 'while this affected France's material hopes, it did even more harm to their morale'. As John Griffiths has pointed out, the inability of players to travel was a frequent problem for France in their early days. Marcel Communeau's team, which also had two changes in the pack, faced an England team heavily influence by Twickenham's home club, Harlequins, who supplied four of their back division. Outside-half Adrian Stoop was joined by his brother Freek and John Birkett at centre, plus Douglas Lambert on the wing. England were led by Birkett. It is one of the more remarkable statistics in English rugby history that while Stoop, along with Wavell Wakefield, was probably England's most renowned captain before Bill Beaumont and recent figures like Will Carling and Martin Johnson, he only actually led them twice. It was, though, a performance that was to bear the imprint of the Quins style. Ian Cooper's biography of Stoop recalls that many press observers were baffled by England's first-half performance, throwing the ball around as though in a sevens tournament, and accused them of not taking the match seriously. The intent was in truth deadly serious - to run the French ragged. Since England also had a pack extremely well adapted to such a style, including men such as the pioneering back row flier Cherry Pillman and Headingley's John King, reckoned to be their shortest ever player - it worked very well. Eight points up from two tries at the break, England ran amok after the break, running up a total score of 37-0, still their biggest ever margin of victory over the French. The main weapon of destruction was Lambert, one of the more intriguing products of Stoop's transformation of the Quins. Known to his friends as Daniel, Lambert had come late to rugby, attending a football-playing school. And when he joined the Quins it was, because of his size and build, as a forward. Cooper tells of Stoop being flattened at a practice match by a tackler who appeared to have come from nowhere. Told that the perpetrator was an 'A' team forward, Stoop immediately resolved that anyone who could run with such pace and power should be in the threequarters, turning a reserve forward with great rapidity into an international back who, as EHD Sewell recorded, was much faster than he looked because of an astonishing length of stride. England's scoresheet that day was a distinguished one. The incomparable Pillman crossed twice. Stoop scored the second and last try (the first had been against France five years earlier) of his international career. There were also tries for forwards Norman Wodehouse, cousin of writer P.G and two years later to be England's first Grand Slam captain, and William Mann of United Services. "Lambert was also to die in France, killed at the Battle of Loos in 1915, only a few months after marrying his childhood sweetheart and leaving a posthumous son. His remains were never recovered." That left 22 points, all of which were accounted for by Lambert. He scored two tries - then worth three points - converted five and also landed two penalties for what then represented an unparalleled one-man haul. 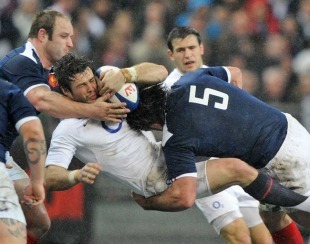 It was not the first time Lambert had acted as the hammer of the French. In 1907 he had set an England record by scoring five tries against them, following with another in 1908. The French were doubtless profoundly relieved that he did not play in 1909 or 1910, or again after 1911. All but two of his career total of 46 points, then an England record, were scored against France. Lambert was also to die in France, killed at the Battle of Loos in 1915, only a few months after marrying his childhood sweetheart and leaving a posthumous son. His remains were never recovered. Yet his records long outlived him. Cyril Lowe overtook him as England's top point scorer in 1922, but those five tries remain a single-match record, equalled by Rory Underwood against Fiji in 1989 and Josh Lewsey in the 2003 World Cup match against Uruguay. His 22 points remained a record for international rugby for more than half a century, finally overtaken by Guy Camberabero's 27 for France against Italy in 1969. They stayed an England record until 1990, when Simon Hodgkinson scored 23 against Argentina. But since Lambert's effort would have been worth 26 points under modern scoring values, it could be argued that it really stood until Rob Andrew's extraordinary 27-point display against the Springboks at Pretoria in 1994. The 22 points also remained a Five Nations record until 1992 when Sebastian Viars scored 24 for France against Ireland. But since Viars exactly replicated Lambert's haul of two tries, five conversions and two penalties it could be argued that he merely tied the record and that it never was broken in the Five Nations. Not until Diego Dominguez marked Italy's debut, and the start of the Six Nations, by scoring 29 points against Scotland in February 2000 was Lambert's mark definitively exceeded. Nobody scored more points for England against France until Jonny Wilkinson kicked them into the World Cup final with eight penalties on a rain-swept night in Sydney in 2003. Lambert still holds the record for England v France in the Championship. Finally comes the record that he still holds a century on. Nobody has ever exceeded his eight tries against France. Two men, Joe Rokocoko and Brian O'Driscoll have equalled his record, but O'Driscoll - who will certainly hope to claim the mark for himself when Ireland play France on February 13, has taken 11 matches and Rokocoko 10 to Lambert's three. Truly, the hammer of the French.